The truck headed east as it blew a tire, lost control, crossed the median strip and hit the westbound bus carrying 48 people aboard, officials told reporters. The accident occurred along Interstate 40 in McKinley County, near Thoreau, New Mexico's state police said. The National Transportation Safety Board said it sent 10 investigators to the site. 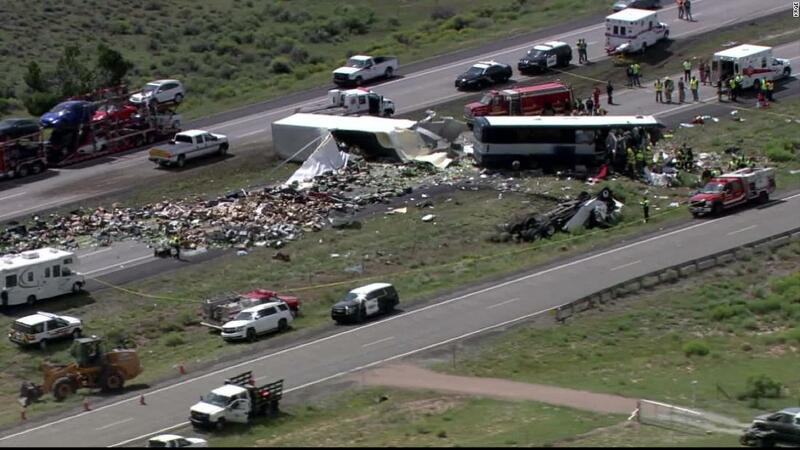 Aerial views of CNN affiliate KRQE showed the bus damaged at the front edge but upright, in the grass median. Nearby was an overturned vehicle and something that looked like a truck trailer on the side, spilled on the median. "Officers and EMS teams are still working actively at the scene," tweeted the state police. Six patients were transported to the University of New Mexico Hospital in Albuquerque, hospital spokeswoman Cindy Foster said. Three are in critical condition, according to Foster. The Greyhound bus involved in the crash carried 47 passengers, the company told CNN subsidiary KOAT. The bus traveled from St. Louis to Los Angeles. Dave Alsup of CNN contributed to this report.